Citation: El-Attar RHM, Wahba OM. Expression of Ki67, CD31, CD68 and P53 in Peripheral and Central Giant Cell Granuloma of the Jaws. Arch Can Res. 2016, 4:2. Introduction: Giant cell granuloma is a relatively common lesion in oral cavity. Central giant cell granuloma usually treated with surgical excision with good prognosis. However in few cases, the lesion exhibits more aggressive behaviour, high recurrence rate and poor prognosis. It is difficult to identify these cases based on histological features so the need for diagnostic markers is of paramount importance to spare patients unwanted effects. Aim: To investigate expression of Ki67, CD31, CD68 and P53 proteins in peripheral and central (aggressive and non-aggressive) giant cell granuloma and whether their expression level can be used to differentiate between aggressive and non-aggressive types. Material and methods: A total of 33 cases; 15 cases of peripheral giant cell granuloma, 10 cases of nonaggressive central giant cell granuloma and 8 cases of aggressive central giant cell granuloma were tested for Ki64, CD31, CD68 and P53 expression using immunohistochemical staining. Results: Ki67 was expressed in all study cases with significantly higher levels in aggressive variant. CD31 expressed in all cases with significantly higher levels in peripheral giant cell granuloma. CD68 was expressed in all cases with no significant differences. P53 was only identified in central giant cell granuloma with significantly higher levels in aggressive type. Conclusion: Ki67 and P53 expression might be useful markers to identify aggressive central giant cell granuloma. Giant cell granuloma is a relatively common tumour-like lesion of the oral cavity . It was considered as a separate lesion from other jaw lesions and termed (giant cell reparative granuloma) by Jaffe in 1953. Though it wasn’t believed to be odontogenic but has been thought to arise from odontoclasts . Central giant cell granuloma (CGCG) is non-neoplastic proliferation mostly affecting mandible as an expansile radiolucency. Peripheral giant cell granuloma (PGCG) is an extra osseous lesion presenting as exophytic mass located on the gingiva or alveolar mucosa . Based on clinical and radiographic features CGCG classified into non-aggressive and aggressive variants. Non aggressive type is more common, with little or no symptoms and slow growth. Aggressive type cause pain and exhibit rapid growth, causing expansion and perforation of cortical bone, displacement of teeth and root resorption . Histologically, both PGCG and CGCG are characterized by the presence of multinucleated giant cells in a background of mononuclear mesenchymal cells . In spite of histological similarity, both lesions have distinctive biological behaviour; PGCG rarely recur or cause bone erosion while CGCG has a higher growth and recurrence rate and can cause root resorption and cortical proliferation . The exact etiology of giant cell lesions is unknown however, several causes have been proposed. PGCG is thought to be a developmental or/and inflammatory reactions in the periodontal ligament or the periosteum [3,6]. Local trauma, intra-osseous bleeding and genetic abnormalities are considered as etiological factors for CGCG . Diagnosis of CGCG normally made histologically from an incisional biopsy; multinucleated giant cells which can have up to 30 nuclei spread throughout the lesion or focally around areas of possible haemorrhage in a background of spindle cell matrix . However, it is difficult to differentiate aggressive type based on histological features. Surgical removal is the main treatment option for CGCG. However, alternative medical treatments have been used with success. For example, intra lesional steroid injection , calcitonin injection  and treatment with alpha interferon . The histogenesis of multinucleated giant cells has been suggested to be of macrophage, endothelial, fibroblast, myofibroblast and osteoclasts progenitor cell origin . Whether multinucleated giant cells or the background spindle cells are responsible for the initiation and progression of these lesions is still not clear. Several studies have tried to anticipate the behaviour of CGCG by assessment of its proliferation activity, vascularity and angiogenesis, anti-apoptotic activity, extracellular matrix proteins expression, inflammatory cytokines and even viral expression [13,14,8,15-19]. But none of these factors has proved successful in all cases. The expression of the human Ki-67 protein is strictly associated with cell proliferation. During interphase, the antigen can be exclusively detected within the nucleus, whereas in mitosis most of the protein is relocated to the surface of the chromosomes. The fact that the Ki-67 protein is present during all active phases of the cell cycle (G1, S, G2, and mitosis), but is absent from resting cells (G0), makes it an excellent marker for determining the growth fraction of a given cell population. The fraction of Ki-67-positive tumor cells is often correlated with the clinical course of the disease [20-22]. CD68 is a member of lysosome associated membrane protein family. It is only expressed in the cells of monocyte/ macrophage lineage, when cells express CD68, it confirms their histiocytic origin . CD68 positive cells are also used clinically as a marker of inflammation and tumour progression . The p53 protein is involved in the maintenance of the cellular integrity after DNA damage by transiently blocking the cell cycle progression. Also it stimulates DNA repair mechanism and trigger apoptosis if DNA repair fails. Alterations in p53, through the loss of heterozygosity, point mutations, deletions, insertions or interaction with viral proteins is a hallmark for many carcinomas and aggressive lesions . Normal tissues as well as benign lesion don’t express P53. The Role of P53 expression in differentiating between aggressive and non-aggressive CGCG is still under investigations. Platelet Endothelial Cell Adhesion Molecule-1 (PECAM-1/ CD31) is a member of the immunoglobulin superfamily, which is expressed on many haematopoietic and endothelial cells. It has been reported as a reliable marker of endothelial differentiation in formalin-fixed paraffin embedded tissue sections . CD31 is located at basal positions along the lateral plasma membrane. It is involved in the formation of new vessels and commonly used to assess angiogenesis in growing tissue . Diagnosis of peripheral giant cell granuloma is fairly easy using H&E stained tissue sections. However differentiating between aggressive and non-aggressive CGCG is challenging using this method. In this study, we are investigating the level of expression of Ki67, P53, CD68 and CD31 proteins in peripheral and central (aggressive and non-aggressive) giant cell granuloma in order to elucidate the molecular differences between these histologically similar lesions. Furthermore, is to investigate whether these proteins expression levels can be used to predict behaviour of aggressive lesions. A total of 33 cases; 15 cases of peripheral giant cell granuloma, 10 cases of non-aggressive central giant cell granuloma and 8 cases of aggressive central giant cell granuloma were collected from archives of the oral pathology department, faculty of dentistry, Tanta University, Egypt. H&E stained tissue sections in combination with the clinical features of the included cases were used to confirm the diagnosis. The immunohistochemical staining performed using a highly sensitive polymer-based system (ChemMate EnVision TM system, Dako Corporation, Carpinteria, CA, USA) with the diaminobenzidine substrate solution as chromogen (Sigma, St. Louis, MO, USA). Formalin fixed paraffin embedded blocks of PGCG and CGCG were cut into 4 um thick sections, deparaffinized in xylene and rehydrated in descending grades of ethanol. Blocking of endogenous peroxidase activity was performed using methanol containing 0.3% of hydrogen peroxide for 30 min. Antigen retrieval was performed by immersing the sections in a citrate buffer, Ph-6.0, for 10 min. Then, the sections were incubated with primary antibodies for one hour in a humid chamber (ki-67, 1:100, clone MIB-5, Dako, Denmark A/S), CD31(PECAM-1 (platelet/endothelial cell adhesion molecule 1), 1:20 clone JC704, Dako, Denmark A/S), CD68, 1: 100 clone KPI, Biocare Medical, Concord, CA/USA) and p53, 1:25 clone DO-7; IgG 2b, Dako, Denmark A/S). The sections were rinsed in phosphate buffered saline (PBS) and secondary antibody was applied at 1:1000 concentrations and incubated for 30 min. The sections were rinsed in PBS and covered by chromogen for detection of the reaction. The sections were then counterstained with Meyer's hematoxylin and dehydrated in ascending grades of ethanol. Finally, the slides were mounted and examined under light microscope. Skin and tonsils tissue sections were used as a positive control according to the manufacturer's instructions. The negative control was obtained by the replacement of primary antibody with PBS. Scoring of positive cells was performed by two independent pathologists. Presence of brown colored reaction was considered as positive reaction. Nuclear immunoexpression was evaluated for Ki67 and P53, cytoplasmic immunoexpression for CD68 and membranous staining for CD31 were measured using Image J software (version 4.10.03, Nikon, Tokyo, Japan). Eight high power (X400) fields were randomly selected to obtain the maximum number of high power fields common to all samples. The proportion of stained cells and the intensity of overall staining were assessed for each field. The proportion of stained cells in each field was assessed as: 0, no stained cells; 1, 25% stained cells; 2, 25-50% stained cells; and 3, more than 50% stained cells. Staining intensity was graded as: 0, negative staining; 1. light staining; 2. moderate staining; and 3. intense staining. A staining-intensity-distribution (SID) score was computed for each sample as follows: The score of the proportion of stained cells for each field was multiplied by the score of the staining intensity in that field to provide an SID score for the field. The average of the eight fields was the SID score for the sample. Pre-coded data was statistically analyzed by the Statistical Package of Social Science Software program (SPSS), version 21. Data was summarized using frequency and percentage. Comparison between groups was performed using Chi-square test or Fisher’s exact test. P values less than 0.05 were considered statistically significant and if less than 0.01 were considered highly significant. H&E stained tissue sections were used to confirm the diagnosis. Histologic and clinical data (X-ray images and follow up) were used to diagnose aggressive form of CGCG (Figure 1). No significant differences in the histopathological features in terms of number or distribution of multinucleated giant cells or mesenchymal spindle cells were noted between aggressive and non-aggressive CGCG. Figure 1: H&E stained tissue sections showing 1(A) PGCG, 1(B) CGCG and 1(C) aggressive CGCG (Original Magnification X100). Ki67 immune-reactivity: All 33 cases used in this study were immunopositive for ki67 with varying degree of expression. In peripheral giant cell granuloma, both stromal cells and multinucleated giant cells showed moderate positivity to Ki67 (Figures 2A and 2B). In non-aggressive central giant cell granuloma, few giant cells showed positivity to ki67 and almost all giant cells were negative (Figures 3A and 3B). Strong reactivity of both giant and stromal cell was noted in aggressive central giant cell granuloma (Figures 4A and 4B). The difference in Ki67 expression in peripheral and central variants was statistically significant (p-value=0.001). Also the difference in expression was highly significant between non aggressive and aggressive variants (p value=0.001) (Table 1 and Graph 1). Table 1: Showing expression levels of CD31, CD68, Ki67 and P53 proteins in the study groups; group 1 (peripheral giant cell granuloma), group 2 (central non-aggressive giant cell granuloma) and group 3 (aggressive central giant cell granuloma). Figure 2: Immune-expression of Ki67 in stromal cells and giant cells in peripheral giant cell granuloma (Original Magnification; a X100 & b X200). Figure 3: Immune-expression of Ki67 in non-aggressive giant cell granuloma showing weak reactivity of giant cells and stromal cells to Ki67 (Original Magnification; X100). Figure 4: Immune-expression of Ki67 in aggressive central giant cell granuloma showing strong reactivity of giant cells and stromal cells to Ki67 (Original Magnification; X100). 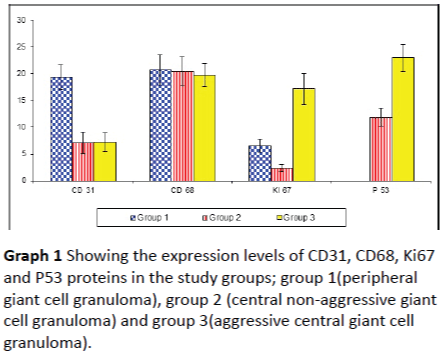 Graph 1: Showing the expression levels of CD31, CD68, Ki67 and P53 proteins in the study groups; group 1(peripheral giant cell granuloma), group 2 (central non-aggressive giant cell granuloma) and group 3(aggressive central giant cell granuloma). CD31 immune-reactivity: Endothelial cells in both peripheral and central giant cell granuloma showed positivity to CD31. Expression in peripheral giant cell granuloma was higher than central giant cell granuloma with significant p value = 0.001 (Table 1 and Graph 1). No significant difference in CD31 expression was found between aggressive and nonaggressive central giant cell granuloma (p = 0.953) (Figures 5A, 5B and 5C). Figure 5: Immune-expression of CD31in (A) peripheral giant cell granuloma, (B) non-aggressive CGCG and (C) aggressive CGCG (Original Magnification; a, b X100 & c X200). CD68 immune-reactivity: In all 33 cases studied (peripheral and central giant cell granuloma), some mononuclear cells and most of the multinucleated giant cells showed cytoplasmic positivity of to CD68 with no significant difference between peripheral and central giant cell granuloma nor aggressive and non-aggressive central giant cell granuloma, (p value = 0.699, Table 1 and Graph 1) (Figures 6A, 6B and 6C). Figure 6: Immune-expression of CD68 in A) peripheral giant cell granuloma, B) non-aggressive central giant cell granuloma and C) aggressive central giant cell granuloma (Original Magnification X100). P53 immune-reactivity: In peripheral giant cell granuloma, no P53 expression was detected in either multinucleated giant cells or stromal cells (Figure 7A). P53 expression in aggressive central giant cell granuloma was significantly higher than nonaggressive type (p value = 0.001, Table 1 and Graph 1). In aggressive CGCG, both the giant cells and the stromal cells were positive for P53 (Figures 7B and 7C). Figure 7: Immune-expression of P53 in (A) peripheral giant cell granuloma, (B) non-aggressive central giant cell granuloma and (C) aggressive central giant cell granuloma (Original Magnification X100). Giant cell granulomas (PGCG and CGCG) are common lesions affecting oral cavity. PGCG can be easily diagnosed using H&E stained tissue sections and can be successfully treated with surgical excision. However, it is difficult to predict the behavior of CGCG (either aggressive or non-aggressive) through histologic features. Size, number of nuclei and distribution of giant cells as well as giant cell nuclear DNA content couldn’t be correlated with the biologic behavior of CGCG . In the current study, there was no difference in the histologic features in terms of number or distribution of multinucleated giant cells between aggressive and nonaggressive CGCG. The proliferative activity of any tissue or neoplasm can be determined by its growth rate. The two most common markers used to study cell proliferation are proliferating cell nuclear antigen (PCNA) and Ki67 antigen . Of these two markers Ki67 has been shown to be excellent for the estimation of the growth fraction in both normal and malignant human tissue and this antibody is now used as the usual standard for the assessment of cell proliferation than PCNA as it does not suffer much from the influence of internal and external factors. Its nuclear expression during a defined period of the cell cycle represents an advantage in its use as a biological marker of mitotic activity . Also it has a much shorter half-life, thus producing less residual staining after cells have gone through proliferative stage . Its presence indicates the proliferative stage of the cell rather than being just residual evidence of the cell that has passed through the stage . In the current study Ki67 expression was investigated in order to assess the difference in the proliferative activity between aggressive and non-aggressive CGCG as well as PGCG. Ki67 was found to be expressed in all study cases; however there was a significant difference in expression between different variants. In aggressive CGCG, both giant cells and mononuclear cells expressed a high level of Ki67 in comparison with low expression observed in few giant cells of nonaggressive CGCG reflecting the difference in behaviour of these variants. It also indicates that both giant cells and mononuclear stromal cells are both actively involved in the proliferative activity of these lesions. Surprisingly, PGCG showed a higher level of Ki67 expression than non-aggressive CGCG. Our results are in accordance with that of Souza et al. who found that ki67 expression was higher in mononuclear cells of PGCG compared to CGCG. However in contrast to our findings, no nuclear ki67 immunoreactivity was detected in giant cells in his study cases. So he suggested that mononuclear cells might be responsible for the growth of these lesions . Also O’Malley et al. (1997) found that only mononuclear cells were expressing Ki67 in CGCG with no significant difference between aggressive and non-aggressive variant . In the current study, PGCG showed higher Ki67 expression than non-aggressive CGCG which is in accordance with results found by Sahar et al. , who found that both giant cells as well as mononuclear cells were expressing Ki67, but in their study the difference in expression was not statistically significant. Our study indicates that both giant cells and mononuclear cells might be involved in the proliferative activity of these lesions. The difference in ki67 expression could be used to differentiate aggressive from non-aggressive giant cell granuloma. Angiogenesis, or neovascularization, is the formation of new blood vessels originating from the endothelium of existing vasculature. Angiogenesis is critical to tumor growth, neoplastic progression and metastasis . There are several immunohistochemical markers that can identify endothelial cells. CD31 is found in large quantities on the surface of endothelial cell. It plays a major role in a number of cellular interactions, particularly in adhesion between endothelial cells and polymorph nuclear leukocytes, monocytes, and lymphocytes during inflammation, and between adjacent endothelial cells during angiogenesis . Previous studies showed that the level of angiogenesis correlates with the behavior of giant cell lesions and that it is higher in aggressive giant cell granuloma . In this study we used CD31 to investigate angiogenesis in different lesion and whether it can be correlated to the behavior of aggressive variants. Our results showed that CD31 was expressed in endothelial cells in both peripheral and central giant cell granuloma indicating that both lesions are undergoing active formation of new vessels needed for lesions growth. No significant difference was found between aggressive and non-aggressive variants of CGCG indicating that the level of angiogenesis is not correlated with the behaviour in our studied cases. However the CD31 expression in PGCG was significantly higher than in CGCG. CD31 is a multifunctional protein. As well as its role in angiogenesis, it is vital to the regulation of inflammatory responses, as it has been shown to serve a variety of proinflammatory and anti-inflammatory functions . The high expression of CD31 in PGCG could be due to increased inflammatory reaction. Our results are in accordance with that of O’Malley et al. who used CD34 expression as a marker of angiogenesis and found that CD34 expression was similar in both aggressive and non-aggressive CGCG . Also, VK et al. found that CD34 expression was higher in PGCG than CGCG . Both studies indicate that vascularity is not correlated to lesions behaviour. On the other hand, our results are different than that of Peacock et al. which showed that CD31 expression was significantly higher in aggressive CGCG than in non-aggressive CGCG . The current study suggests that CD31 as an angiogenesis markers cannot differentiate between aggressive and non-aggressive CGCG. The role/function of giant cells in these lesions is a matter of a big debate; many believe that giant cells represent a reactive component and that mononuclear cells are the proliferative tumour cells responsible for the biologic activity of these lesions [37-39]. The multinucleated giant cells are considered to be formed from the fusion of monocyte/macrophage precursors differentiated into osteoclasts. The mononuclear cell component consists of a population of macrophage-like cells, which appears to include a subset of osteoclasts precursors, and a proliferating spindle-shaped stromal cell population which has the capacity to differentiate along fibroblast/osteoblast lines [12,40,41]. To investigate the histogenic origin of these cells in both peripheral and central giant cell granuloma and whether it differs according to behaviour of the lesions we studied the CD68 expression. CD68 is a monocyte-macrophage lineage marker which been often used to investigate giant cells. Its expression suggests macrophage/ histiocyte origin of cellular component of lesions. Our results showed CD68 positive reactivity of some mononuclear cells and most of multinucleated giant cells in both peripheral and central giant cell granuloma. This was in accordance with Aragao et al. who found that CD68 expression in many mononuclear cells and majority of multinucleated giant cells . Also, Meng et al. described CD68 positive reaction in all multinucleated giant cells and some of mononuclear cells . Torabinia et al. as well found that, most of giant cells and a group of mononuclear cells of stroma expressing CD68 protein . These studies and ours suggest the existence of a histiocyte macrophage origin for giant cells and some of the stromal cells. As mentioned above, the CD68 positive stromal cells could be osteoclasts precursors. In the current study, no significant difference in CD68 expression between study groups was observed between peripheral and central giant cell granuloma. This is similar to the findings by  and  that show no significance difference in CD68 expression between CGCG and PGCG. On the other hand, VK et al. showed that CD68 protein expression was significantly higher in CGCG when compared to PGCG suggesting that higher frequency of cells of the macrophage lineage in CGCG than PGCG . Florez-Moreno et al. also found that CD68 protein expression in multinucleated giant cells was significantly higher in CGCG than PGCG . It can be concluded that, despite different behaviour between peripheral and central giant cell granuloma, they share the same origin. And probably the difference in expression noted in some studies may be attributed to the size of the lesion and the number of giant cells. P53 protein is involved in the maintenance of cellular integrity after DNA damage by blocking cell cycle progression. Mutation in P53 might affect its function including loss of wild type activity, a dominant negative effect or gain of oncogenic potential . P53 protein can induce cell apoptosis to prevent the mutated DNA passage to the next generation in cases of failed DNA repair. Due to loss of cell supervision of P3 protein after P53 gene mutation, cells are susceptible to entry of S phase with injured DNA. Genetic instability is the source of gene mutation and chromosomal aberration, leading to malignant cell change and tumour formation . So P53 status can indicate the genetic defects in different lesions and consequently the aggressive behaviour. In the present study P53 expression was evaluated in PGCG and CGCG. The results showed that PGCG didn’t express P53 in either multinucleated giant cells or mononuclear stromal cells indicating the genetic integrity of this lesion which is reflected on its behaviour. On the other hand, CGCG (aggressive and non-aggressive) expressed high levels of P53. Interestingly, Aggressive type expressed higher levels of P53. Also both multinucleated and stromal cells expressed P53 in aggressive type, however only multinucleated giant cells expressed P53 in non-aggressive type. It can be concluded that aggressive behaviour of CGCG can be attributed to the high level of P53 protein in stromal cells. As the stromal cells can differentiate into giant cells, this could results in more osteoclastic activity, destruction and rapid growth in aggressive lesions. Our results are in accordance with results of Kader, who found that P53 was expressed in low levels in CGCG than giant cell tumour of bone. One case of CGCG who showed high level of P53 was aggressive in behavior . On the other hand, de Souza et al. and Souza et al. found no P53 expression in any of their CGCG  and . This can be attributed to the different ethnic backgrounds of the cases under investigation and consequently exposure to different etiological factors which might influence susceptibility to gene mutation. These finding suggested that high P53 expression can be used as a marker for aggressive behavior of CGCG. Neville BW, Allen CM, Bouquot JE (2009) Oral and maxillofacial pathology. (3rdedn). St. louissaunders, Elseivier. Jaffe HL (1953) Giant-cell reparative granuloma, traumatic bone cyst, and fibrous (fibro-oseous) dysplasia of the jawbones. Oral Surg Oral Med Oral Pathol 6: 159-175. Motamedi MH, Eshghyar N, Jafari SM, Lassemi E, Navi F, et al. (2007) Peripheral and central giant cell granulomas of the jaws: a demographic study. Oral Surg Oral Med Oral Pathol Oral RadiolEndod 103: e39-43. Reddy V (2012) Incidence of central giant cell granuloma of the jaws with clinical and histological confirmation: an archival study in Northern India. Br J Oral MaxillofacSurg 50: 668-672. Flórez-Moreno GA, Henao-Ruiz M, Santa-Sáenz DM, Castañeda-Peláez DA, Tobón-Arroyave SI (2008) Cytomorphometric and immunohistochemical comparison between central and peripheral giant cell lesions of the jaws. Oral Surg Oral Med Oral Pathol Oral RadiolEndod 105: 625-632. Katsikeris NE (1988) Peripheral giant cell granuloma – A clinicopathologic study of 224 new cases and review of 956 reported cases. Kakarantza-Angelopoulou, A.P. Angelopoulos (eds. )Int J Oral MaxillofacSurg 17: 94-99. Lin YJ, Chen HS, Chen HR, Wang WC, Chen YK, et al. (2007) Central giant cell granuloma of the mandible in a 7-year-old boy: a case report. Quintessence Int 38: 253-259. O'Malley M (1997) Central giant cell granulomas of the jaws: phenotype and proliferation-associated markers. J Oral Pathol Med 26: 159-163. Jacoway JR (1988) Central giant cell granuloma: An alternative to sugical therapy. Oral Surg Oral Med Oral Pathol Oral RadiolEndod 66: 572. Harris M (1993) Central giant cell granulomas of the jaws regress with calcitonin therapy. Br J Oral MaxillofacSurg 31: 89-94. Kaban LB, Mulliken JB, Ezekowitz RA, Ebb D, Smith PS, et al. (1999) Anti-angiogenic therapy of a recurrent giant cell tumor of the mandible with interferon alfa-2a. Pediatrics 103: 1145-1149. Liu B, Yu SF, Li TJ (2003) Multinucleated giant cells in various forms of giant cell containing lesions of the jaws express features of osteoclasts. J Oral Pathol Med 32: 367-375.
de Souza PE, Paim JF, Carvalhais JN, Gomez RS (1999) Immunohistochemical expression of p5, MDM, Ki-67 and PCNA in central giant cell granuloma and giant cell tumor. J Oral Pathol Med 28: 54-58. Souza PE, Mesquita RA, Gomez RS (2000) Evaluation of p5, PCNA, Ki-67, MDM2 and AgNOR in oral peripheral and central giant cell lesions. Oral Dis 6: 35-39. Vk V, Hallikeri K, Girish HC, Murgod S (2014) Expression of CD34 and CD68 in peripheral giant cell granuloma and central giant cell granuloma: An immunohistochemical analysis. J Oral MaxillofacPathol 18: 341-348. Zyada MM, Salama NM (2013) Detection of the Epstein-Barr virus and DNA-topoisomerase II- Î± in recurrent and nonrecurrent giant cell lesion of the jawbones. Biomed Res Int 2013: 327424. Sahar AD, Reham S, Esmail E, Mervat MM (2014) Novel understanding of the histogenesis of central giant cell tumour of long bones in comparison to giant cell lesions of the jaws. 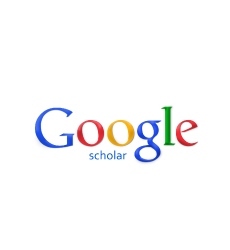 Academic Journal of Cancer Reasearch 7: 19-26. Hammas N, Laila C, Youssef AL, Hind el F, Harmouch T, et al. (2012) Can p63 serve as a biomarker for giant cell tumor of bone? A Moroccan experience. DiagnPathol 7: 130. Papanicolaou P, Chrysomali E, Stylogianni E, Donta C, Vlachodimitropoulos D (2012) Increased TNF-α, IL-6 and decreased IL-1β immunohistochemical expression by the stromal spindle-shaped cells in the central giant cell granuloma of the jaws. Med Oral Patol Oral Cir Bucal 17: e56-62. Jalava P (2006) Ki67 immunohistochemistry: a valuable marker in prognostication but with a risk of misclassification: proliferation subgroups formed based on Ki67 immunoreactivity and standardized mitotic index. Histopathology 48: 674-682. Gentile V, Vicini P, Giacomelli L, Cardillo MR, Pierangeli A, et al. (2006) Detection of human papillomavirus DNA, p53 and ki67 expression in penile carcinomas. Int J ImmunopatholPharmacol 19: 209-215. Lee CS (1996) Differences in cell proliferation and prognostic significance of proliferating cell nuclear antigen and Ki-67 antigen immunoreactivity in in situ and invasive carcinomas of the extrahepatic biliary tract. Cancer 78: 1881-1887. AragãoMdo S, Piva MR, Nonaka CF, FreitasRde A, de Souza LB, et al. (2007) Central giant cell granuloma of the jaws and giant cell tumor of long bones: an immunohistochemical comparative study. J Appl Oral Sci 15: 310-316. Ashley JW, Shi Z, Zhao H, Li X, Kesterson RA, et al. (2011) Genetic ablation of CD68 results in mice with increased bone and dysfunctional osteoclasts. PLoS One 6: e25838. Joerger AC, Fersht AR (2008) Structural biology of the tumor suppressor p53. Annu Rev Biochem 77: 557-582. Silverman S Jr, Gorsky M, Lozada F (1984) Oral leukoplakia and malignant transformation. A follow-up study of 257 patients. Cancer 53: 563-568. DeLisser HM, Christofidou-Solomidou M, Strieter RM, Burdick MD, Robinson CS, et al. (1997) Involvement of endothelial PECAM-1/CD31 in angiogenesis. Am J Pathol 151: 671-677. Eckardt A, Pogrel MA, Kaban LB, Chew K, Mayall BH (1989) Central giant cell granulomas of the jaws. Nuclear DNA analysis using image cytometry. Int J Oral MaxillofacSurg 18: 3-6. Tumuluri V, Thomas GA, Fraser IS (2002) Analysis of the Ki-67 antigen at the invasive tumour front of human oral squamous cell carcinoma. J Oral Pathol Med 31: 598-604. Vieira FL (2008) Cellular profile of the peritumoral inflammatory infiltrate in squamous cells carcinoma of oral mucosa: Correlation with the expression of Ki67 and histologic grading. BMC Oral Health 8: 25. Lim JJ, Kang S, Lee MR, Pai HK, Yoon HJ, et al. (2003) Expression of vascular endothelial growth factor in salivary gland carcinomas and its relation to p5, Ki-67 and prognosis. J Oral Pathol Med 32: 552-561. Allison RT, Best T (1998) p5, PCNA and Ki-67 expression in oral squamous cell carcinomas: the vagaries of fixation and microwave enhancement of immunocytochemistry. J Oral Pathol Med 27: 434-440. Meert AP, Paesmans M, Martin B, Delmotte P, Berghmans T, et al. (2002) The role of microvessel density on the survival of patients with lung cancer: a systematic review of the literature with meta-analysis. Br J Cancer 87: 694-701. Müller AM, Hermanns MI, Skrzynski C, Nesslinger M, Müller KM, et al. (2002) Expression of the endothelial markers PECAM-, vWf, and CD34 in vivo and in vitro. ExpMolPathol 72: 221-229. Peacock ZS, Jordan RC, Schmidt BL (2012) Giant cell lesions of the jaws: does the level of vascularity and angiogenesis correlate with behavior? J Oral MaxillofacSurg, 70: 1860-1866. Privratsky JR, Newman DK, Newman PJ (2010) PECAM-1: conflicts of interest in inflammation. Life Sci 87: 69-82. Aparisi T, Arborgh B, Ericsson JL (1977) Giant cell tumor of bone: detailed fine structural analysis of different cell components. Virchows Arch A PatholAnatHistol 376: 273-298. El-Mofty SK, Osdoby P (1985) Growth behavior and lineage of isolated and cultured cells derived from giant cell granuloma of the mandible. J Oral Pathol 14: 539-552. Hasegawa T, Hirose T, Seki K, Sano T, Hizawa K (1993) Transforming growth factor alpha and CD68 immunoreactivity in giant cell tumours of bone: a study on the nature of stromal and giant cells, and their interrelations. J Pathol 170: 305-310. Bonetti F, Pelosi G, Martignoni G, Mombello A, Zamboni G, et al. (1990) Peripheral giant cell granuloma: evidence for osteoclastic differentiation. Oral Surg Oral Med Oral Pathol 70: 471-475. Helming L, Gordon S (2007) The molecular basis of macrophage fusion. Immunobiology 212: 785-793. Meng XM, Yu SF, Lu M, Zheng J, Han ZH (2005) Expression of macrophage inflammatory protein-1alpha, a disintegrin-like and metalloproteinase 8 and 1, and CD68 protein in giant cell lesions of jaw and giant cell tumors of long bone. Zhonghua Bing Li XueZaZhi 34: 393-396. Torabinia N, Razavi SM, Shokrolahi Z (2011) A comparative immunohistochemical evaluation of CD68 and TRAP protein expression in central and peripheral giant cell granulomas of the jaws. J Oral Pathol Med 40: 334-337. Ko LJ, Prives C (1996) p53: puzzle and paradigm. Genes Dev 10: 1054-1072. Dong M, Dong Q, Zhang H, Zhou J, Tian Y, et al. (2007) Expression of Gadd45a and p53 proteins in human pancreatic cancer: potential effects on clinical outcomes. J SurgOncol 95: 332-336. Kader OA (2011) Histopathological and immunohistochemical study of giant cell granuloma of the jaw and giant cell tumor of long bones (comparative study). The Iraqi postgraduate medical journal 10: 33-39.